Plectranthus is a genus of about 350 species in the Mint Family (Lamiaceae), found principally in Africa, Madagascar, India, Australia and Pacific islands. Some of these were formerly classified as Coleus and are often sold under this name in nurseries. Some are valued horticulturally for their attractive foliage, some for their flowers, and some for both. 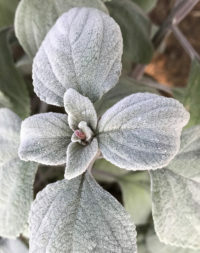 One species with beautiful silvery leaves is Plectranthus argentatus, native to eastern Australia, in the states of Queensland and New South Wales. 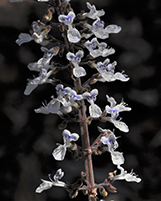 Though it is native to a summer-rainfall area, Plectranthus argentatus grows quite well in The Ruth Bancroft Garden’s Mediterranean climate, needing only an occasional watering during the summer months to keep it happy. Plants are up to 3 feet tall or even a little more (to 1 m or so), spreading with time to become a clump to 6 feet wide (1.8 m). This species seems to prefer light shade, but it is tolerant of a wide range of sunlight levels, from fairly deep shade to full sun. The leaves of P. argentatus are up to 6¾ inches long (17 cm) and 4 inches wide (10 cm), with a downy covering of silvery reflective hairs (the name “argentatus” means “silvered”). The leaf veins show up as furrows in the furry surface, and the margins are slightly scalloped. The flowers of this species are not unattractive, but they are quite small and pallid, so they do not make much of an impression from a distance. As is usual in the family, the flowers are 2-lipped, with a white scoop-like lower lip which cradles the stamens. The upper lip is lobed, with two large lobes sticking up like Mickey Mouse-ears, and a curved band of blue running across the white background of each. 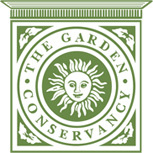 The flowering time is not consistent, but plants at The Ruth Bancroft Garden tend to flower in summer and fall.